I've thought that I would really enjoy traveling to Costa Rica sometime. 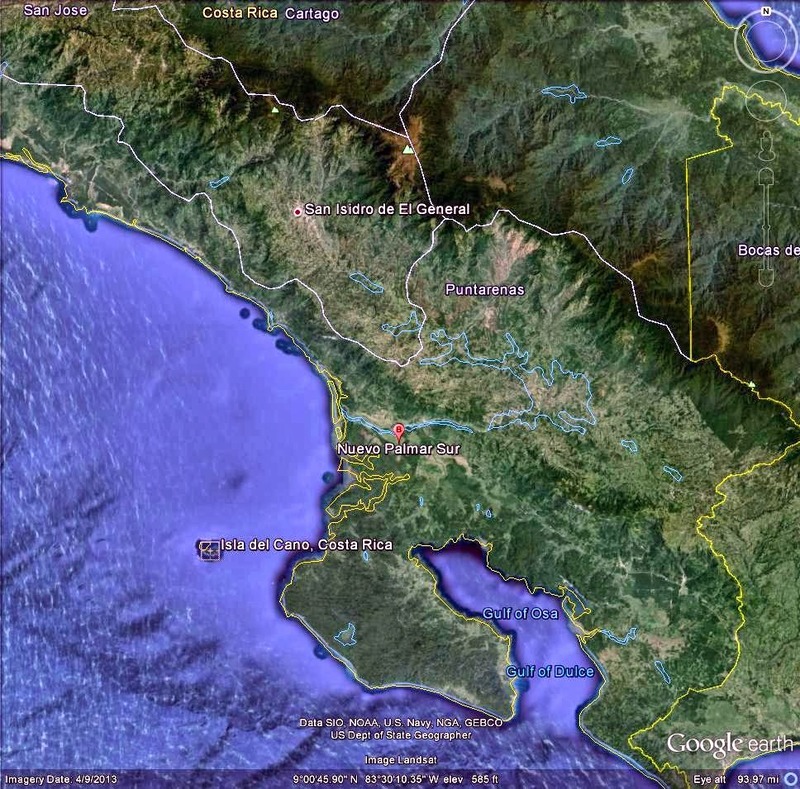 Located in Central America, between Nicaragua and Panama, it is tropical, politically and socially stable, with a good economy and a healthy tourist trade. 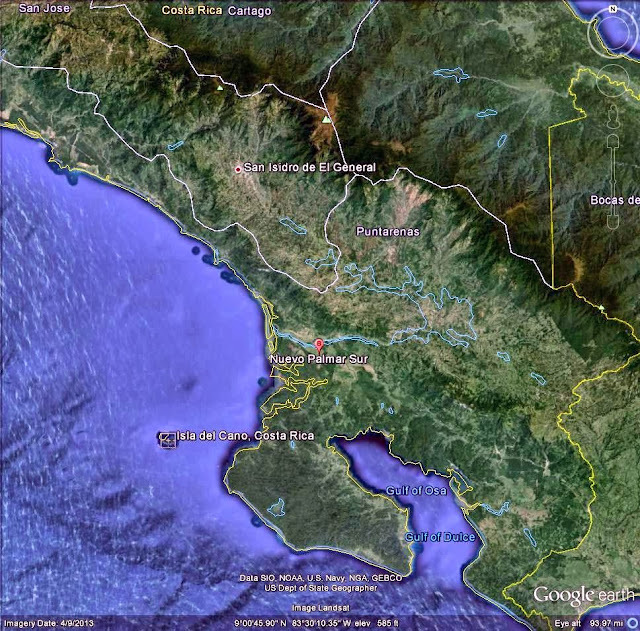 It has most of the things that attract people to a Latin American country and none of the problems usually associated with such. It also has something relevant to our discussions - the stone spheres of Costa Rica, locally known as "Las Bolas." First discovered by Westerners in the 1930's by the United Fruit Company, while they were clearing jungle for banana plantations, there are some 390 spheres scattered all over the Diquis River delta, as far away as Panama, but particularly around Palmar Sur and Canos Island. 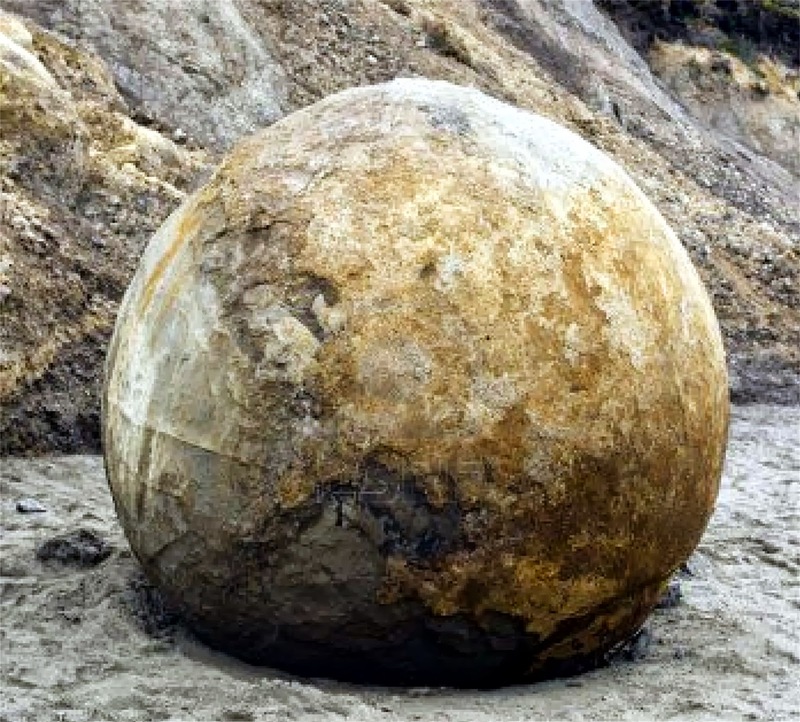 They range in size from eight feet in diameter and sixteen tons, down to the size of a basketball and everything in between. 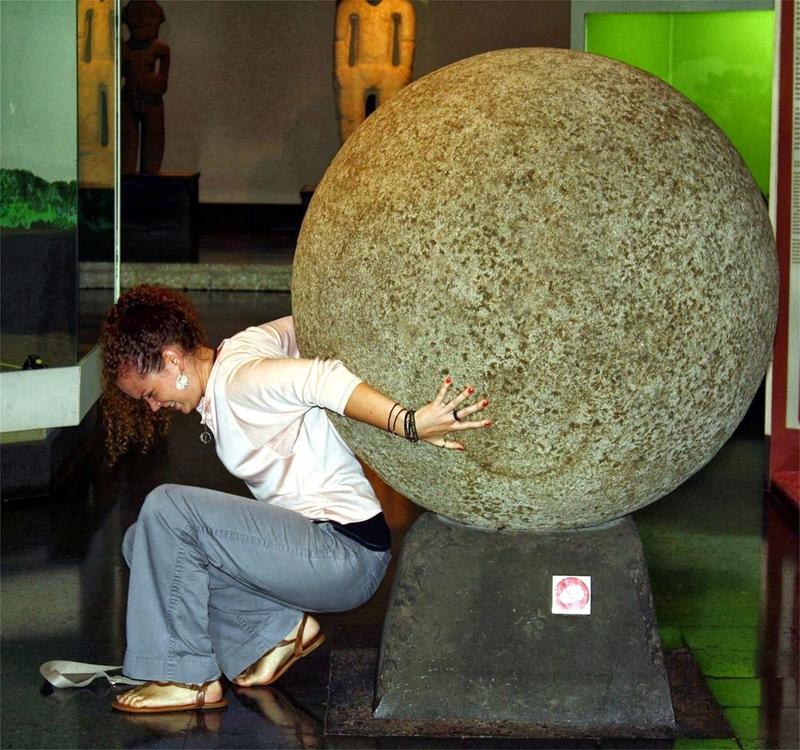 Remember in the first Indiana Jones movie, where the giant stone ball was rolling down on him? Like that. They are most often composed of certain varieties of basalt, but there are examples made of sandstone or limestone. People who have examined them say that the original finish seems highly polished. The interesting thing (other than their very existence and the question of their purpose), is the fact that they are geometrically within 95% of being a perfect sphere. 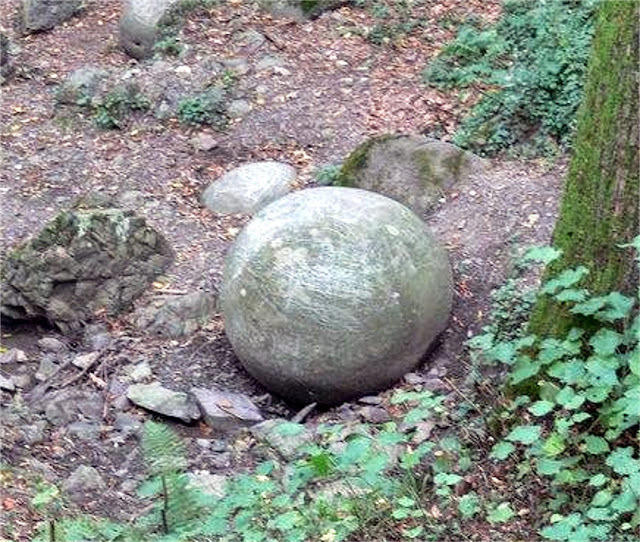 I would guess that the 5% variation comes from the fact that these balls were subject to erosion for perhaps thousands of years and were moved by water, surely colliding with other objects and causing them damage. I don't know if you've ever tried to make a perfect sphere. Perhaps when you were a kid, you tried to roll some clay between your hands to form a ball. If you have, you know that making a perfect sphere is very difficult, even with such a malleable substance as clay. In the environment of the earth's surface, a perfect sphere is only formed by gases and liquids. Think of soap bubbles in the air or air bubbles in the water. Even the planet earth itself is not a perfectly round sphere. 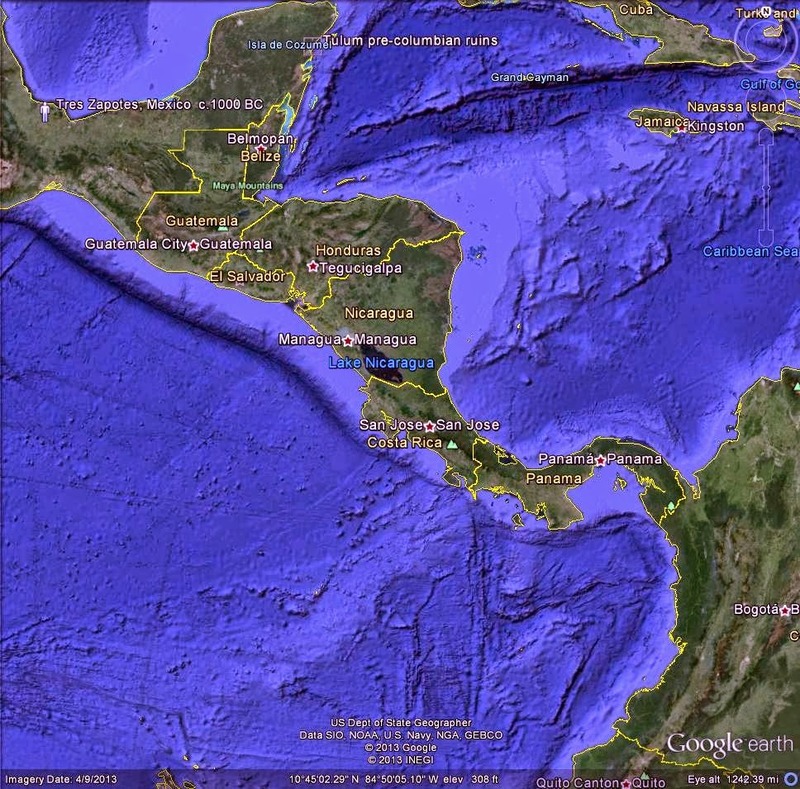 The effects of the earth's spin cause it to be slightly bigger in diameter in the equator than it is from pole to pole. Think of a ball that has been slightly squashed. 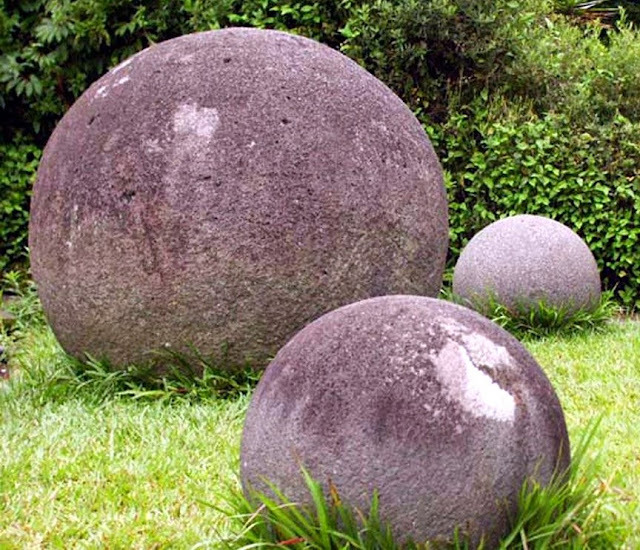 These stone balls are made of very hard materials. The idea that you could bash these stones with other rocks until you made it round, then smoothing the surface by rubbing it with sand is ludicrous. An interesting sidelight, although not relevant to our discussion, is the story that the native peoples of this area tell about the stone balls. 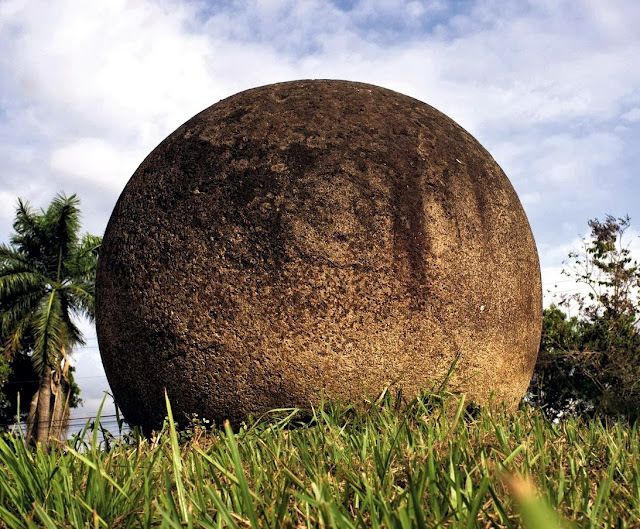 They say that the spheres are the cannon balls used by their thunder god to drive off the gods of wind and hurricanes. The spheres are heavier than they look! 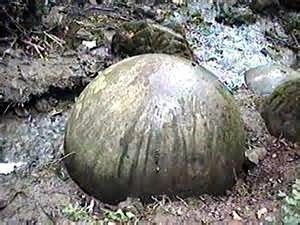 While the native peoples didn't know anything about cannons until the coming of the Spanish in the 1500's, it is interesting to note that historians had located some stone cannonballs used on the ships of Henry the Eighth. Having recreated a cannon fashioned after cannons from the period that had been found on shipwrecks, they tried out some of the stone cannonballs. They found that, not only did the stone cannonballs strike their targets with tremendous force, but the stone then shattered, flinging fragments everywhere, much like a modern day shrapnel grenade and with equally devastating consequences. The first anti-personnel cannon ball! Just for argument's sake, if the stone balls were indeed cannonballs, they would far exceed anything we could do. The largest cannon on record, the Nazi's Gustav gun, could only fire a round three feet in diameter weighing 16,540 lb. 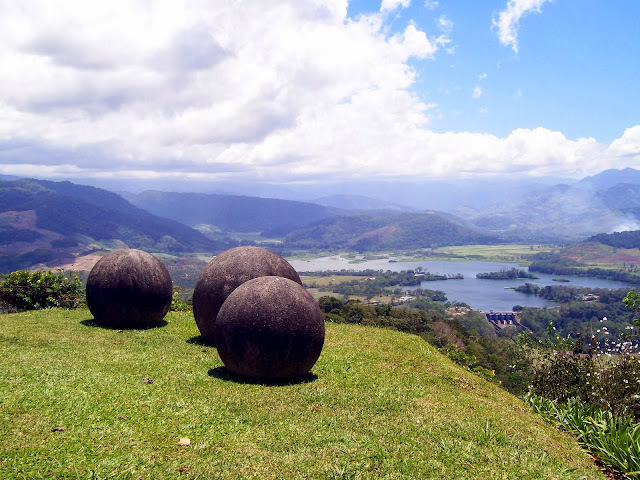 The largest of the Costa Rican Las Bolas is eight to ten feet in diameter and weighs between 50,000 and 62,000 lbs. That's 31 tons. If they were fired from some Brobdingnagian cannon, they would no longer be a true sphere, or even close, from the damage incurred upon impact. No stones with such damage have been found. Even if they are in pieces, the reassembled pieces form true spheres. The other theory is that they were formed in space. 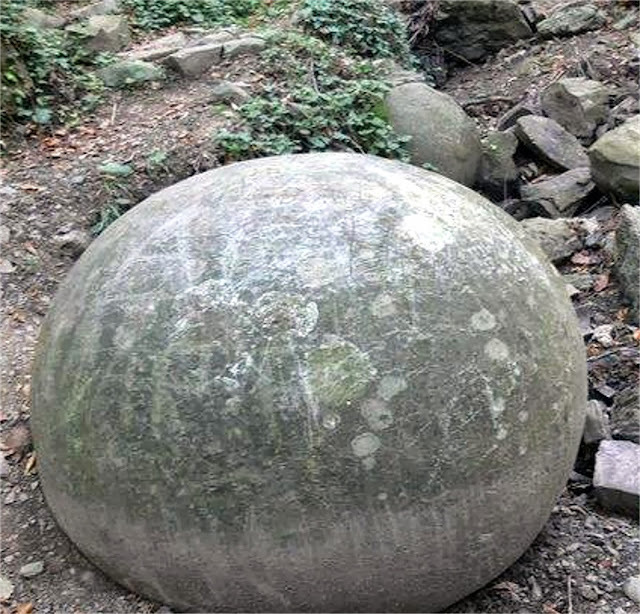 Since a liquified stone released into a zero gravity environment would form a perfect sphere (we talked about that in the blog entry about the Klerksdorp Spheres), perhaps they were formed in space and fell out of orbit? That scenario would produce an effect like a meteor and the atmospheric friction would cause significant burn marks on the spheres. Such marks have not been found. 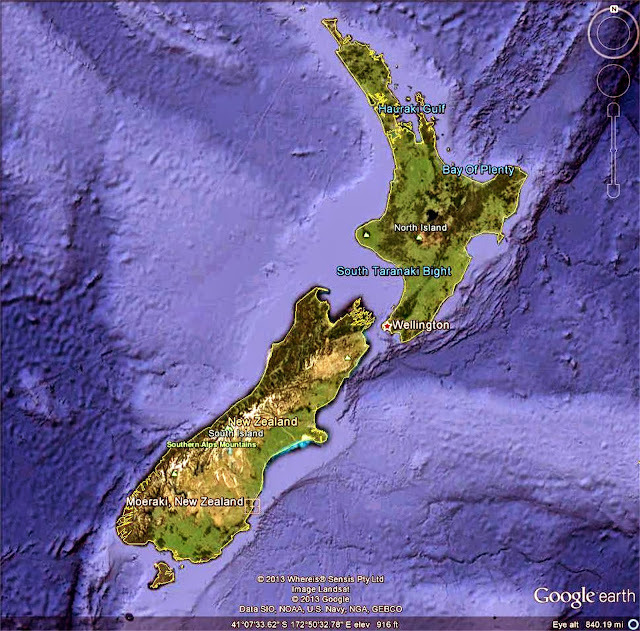 Let's go half way around the world to a fishing village in New Zealand called Moeraki in the Maori tongue. In that region, mainly on the beach, are similar perfectly spherical boulders that are composed of various materials and are hardened by calcite mixed in with the material. The strange thing is that the centers of the spheres are either soft mudstone or hollow altogether. As you move to the outer shell, it becomes harder and harder. 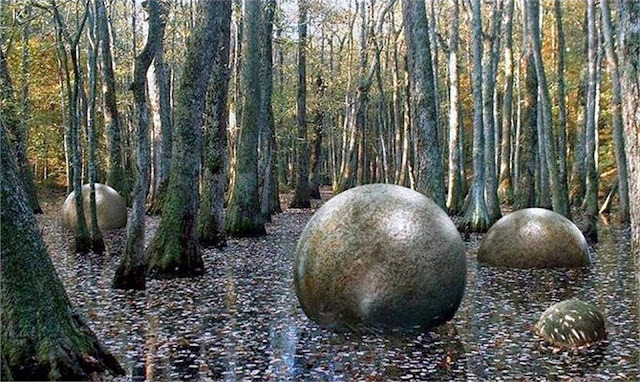 The materialists, of course, try desperately to show how this could come about naturally through the action of water on ancient mud, forming balls that harden and are then were polished by further water erosion. Hmmm. Let us then go up to Europe, in the country of Bosnia-Herzegovina, in the area around the small villages of Trn, Zavidovici, Banja Luca and Teocak. Here, again in stream beds and water cut ravines, are stone spheres. These are somewhat different. They are made of granites and diorites - very hard material, very difficult to work. Some of them have holes drilled in them. The most interesting part is that they are heavier than they should be. 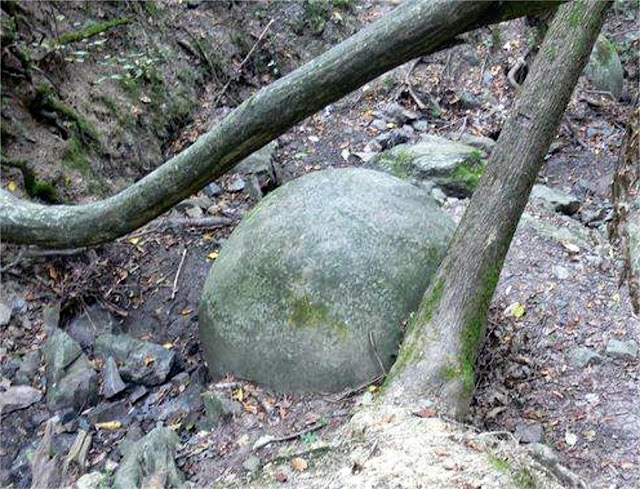 A chemist performed an analysis of the stone composing the balls and the native stone still in the ground in the area. His analysis concluded that the stone material had been melted, additional chemicals added to them and then most probably poured into a mold that formed it into the spherical shape. We've discussed this before. Granite doesn't melt until it reaches about 2,300 degrees Fahrenheit. That's blast furnace temperature! Our current Western civilization didn't develop that kind of industrial technology until the late 1800's. Iron cauldrons heated by wood fires would certainly never do it! Yet that is what evolutionary historians would have us believe was the height of technology in the earliest periods of man's history! 1. 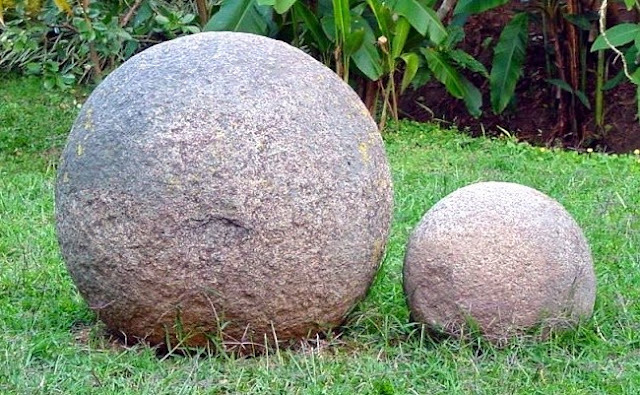 Artifacts (the spheres) exist that could have been produced by nothing other than advanced technology and heavy industry. Although there are many of them and probably many more yet to be found (which means that they were very important to the people that made them), their purpose cannot be discerned. 2. 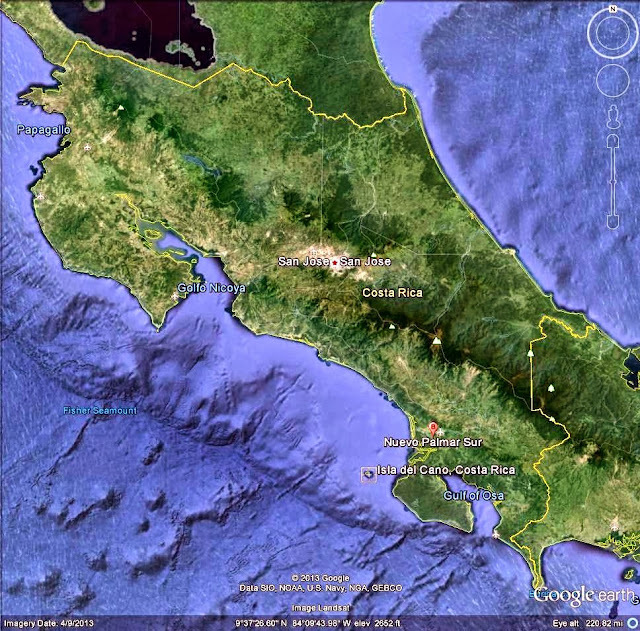 Said artifacts are spread throughout the world. 3. 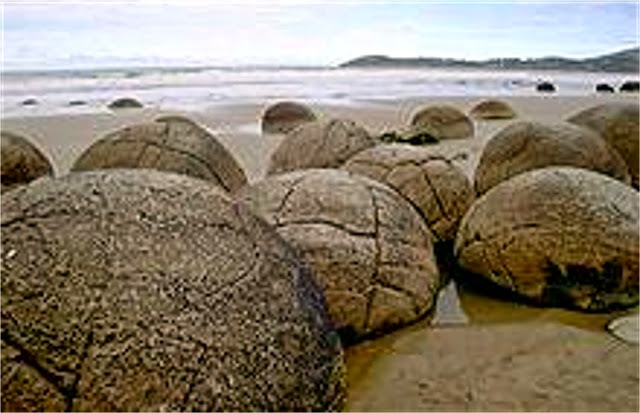 The fact that they are found in stream beds, rivers and beaches indicates that they are deeply buried and are being washed out of deep strata. 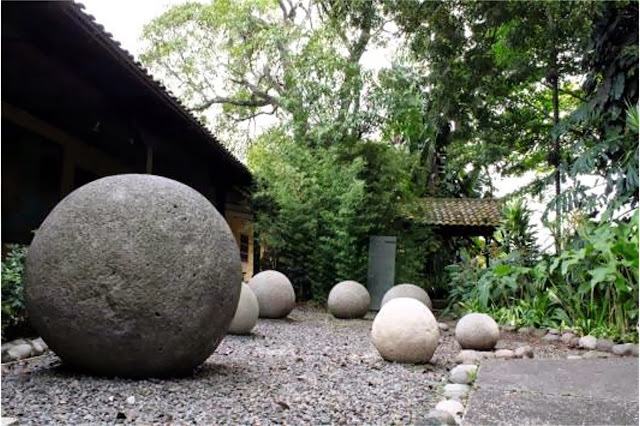 A heavy, dense stone ball would necessarily sink to the bottom of whatever strata it might be in - if not in the beginning, then over time. I really hope that you're starting to see a pattern here. It looks to me like more evidence of the Pre-flood people. The Biblical record makes far more sense here than all the airy-fairy tales that the materialistic, evolutionary scientists try to propagandize - as usual.